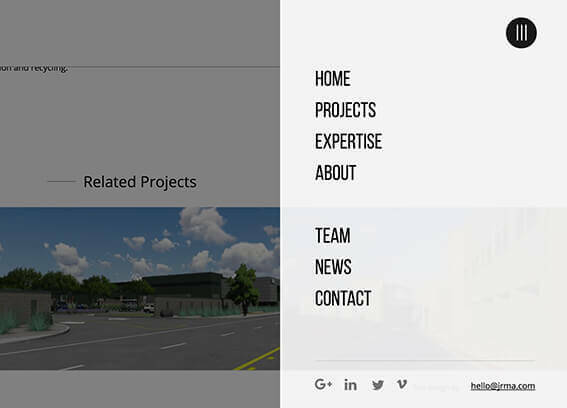 JRMA is a world-class architectural and structural engineering firm who has designed or built over 3,600 industrial, commercial and institutional building projects across the world. Their elegant and sophisticated architectural designs span a variety of industries, including: aviation, solid waste, organics processing, industrial, commercial, and food processing, but their website wasn't fully portraying their abilities in these areas. elegance and class of their architectural designs. Like many of our projects, our team kicked off this redesign by doing a deep dive into who JRMA is, what the goals for their new website were, and perceptions they hoped to change with a freshly redesigned site. As we dug deep and got to know their team, it became very clear that their old site was failing to tell the story of the amazing work their team was doing. While the many projects in their portfolio have already stood the test of time with elegant design that is still relevant 10, 20, and 30 years after it was completed, they needed a website that would do the same. Our team set out to build a site that would tell the story of their accomplishments in an exciting, visual way. After doing client interviews, a design analysis, and scoping out the competition, we were ready to put our ideas into action. Kicking off the UX strategy phase, our strategists made a few minor adjustments to the current sitemap to help the story flow across the pages of the new site. With lots of other sites to draw inspiration from in front of us, we started piecing together what their story would look like across the site. 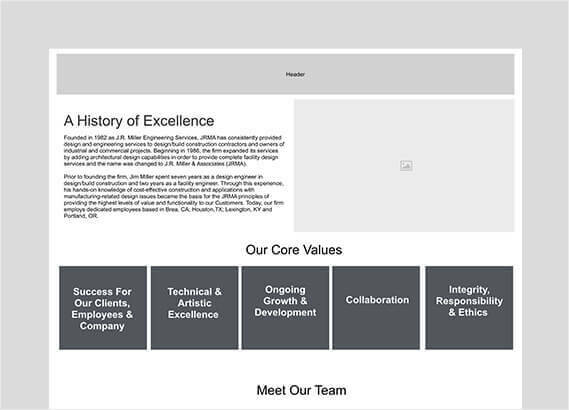 Wireframes allowed us to create rough outlines of how the content would fit together to display JRMA’s strengths to any potential clients visiting their website. Our team knew that we would be using graphics heavily when we got to the design phase, which made us be even more intentional about how the supporting copy was implemented across the site. Balancing just enough copy with imagery would be key to showing value while creating intrigue and prompting potential clients to contact JRMA. The build phase was where our designers were able to take all the beautiful images JRMA had of their projects and compose the page designs that would tell their story. Working their magic, our design team melded together imagery and text together to create beautiful layouts. But a page design without code is of no use to anyone, which is where our programming team stepped in to bring the pages to life. To ensure an immersive visual experience, we developed the site on a fluid responsive grid. Everything was coded using the latest technologies on top of a custom .NET platform. An intuitive CMS was built out to give the client the ability to make quick and easy updates to their site in the future. As with all of our projects, a meticulous round of testing ensured that the site and CMS were both running smoothly before prepping for the launch. Our QA engineers reviewed the site on all of the latest browsers and mobile devices to ensure that it was performing optimally across the board. When it was time for launch, our server team set everything up on the client’s chosen server and pointed the domain to take the site live. It was time to release their new site to the world! The site was met with instant excitement and by both company employees and clients. Employees were excited to have a tool that they could now use to show their company’s qualifications during sales calls and at trade shows, and clients were finally able to see online an accurate portrayal of the high-caliber work that JRMA has produced. Visual storytelling is a proven way to capture the attention of your target audience online, and JRMA’s new site uses it to their advantage with their beautifully redesigned website. 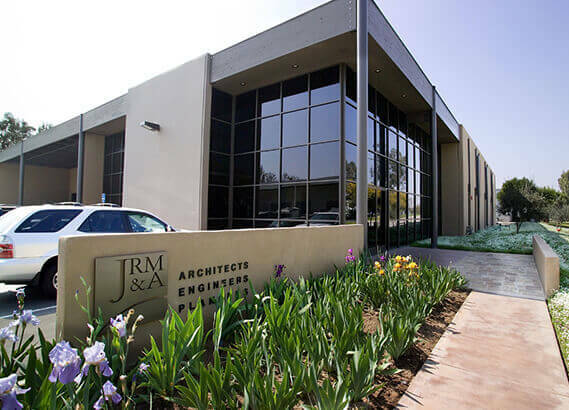 With a website that is now an accurate reflection of their world-class work, JRMA looks like the design-focused architectural and engineering firm that they are.